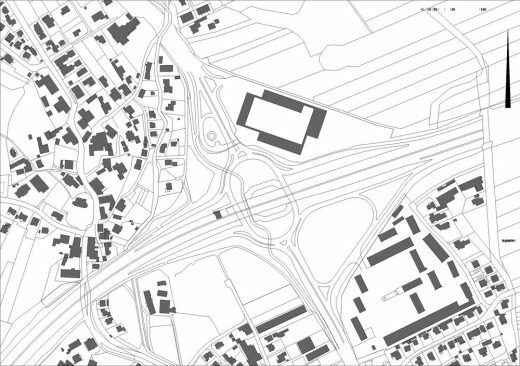 The design of the new motorway maintenance centre is strongly influenced by its direct access to the motorway. The centre is nestled into the sloping plain of the northwest quadrant. The entrance is located on the northwest side of the site and a flat ramp leads down to the existing underpass. The individual buildings come together to form a clearly structured complex. Four buildings serving different functions are grouped around a spacious courtyard. The deliberate use of gaps opens up visual axes with the surrounding landscape and creates exciting spatial sequences. The enclosed courtyard makes it easy to keep track of things within the centre and protects the neighbouring residents from noise. The 25-metre tall salt silos stand like towers in the middle of the complex. 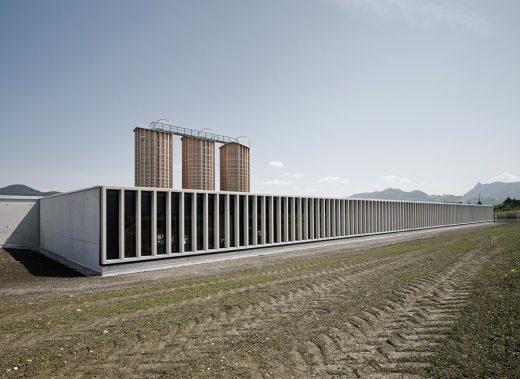 Four different building parts around the central fuel station and the three salt silos, simple and elegant blocks, are arranged around the asphalted courtyard. 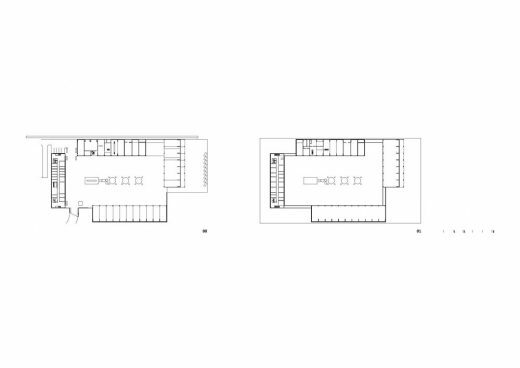 The proportions resulted from the number of vehicle spaces and the turning radii, the functions are stringently organised around the rectangular, sunken courtyard. Although the individual sections differ in height, a single continuous eaves line connects all the parts of the building. The largely closed form prevents noise entering inside or escaping outside. 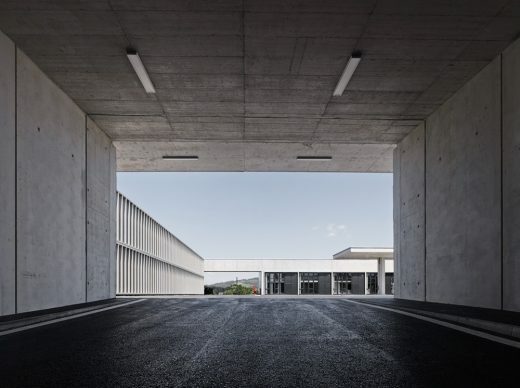 The halls for the trucks are embedded in the site, from outside they visible only in the form of bands of high level glazing screened by exposed concrete louvers. These provide shade for the halls, while also allowing a lot of sunlight and warmth to enter from the south. 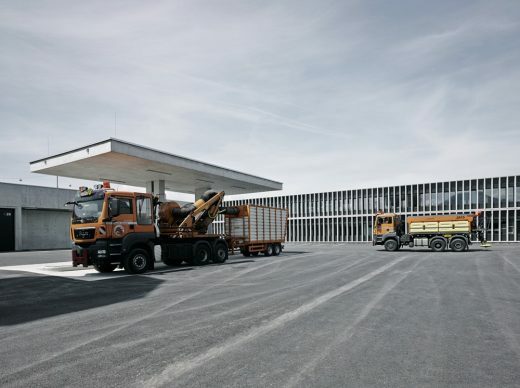 Below various ploughs, salt spreaders and other appliances are stored directly at the parking place of the respective truck in special shelving on the embedded wall slabs. This is efficient and saves time. Thanks to the location in the south-west and the storage mass of the concrete the temperature here in winter, without heating, is still five degrees. In summer it is agreeably cool. 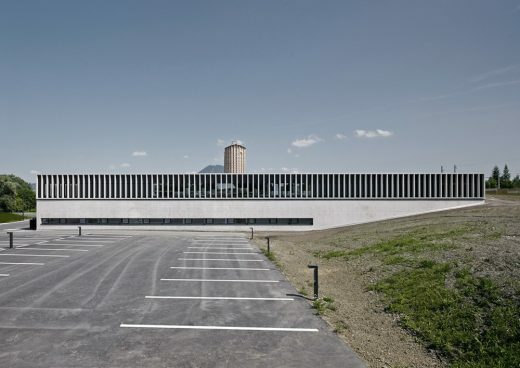 The appearance of the motorway maintenance centre is characterized by the interplay of concrete, glass and aluminium. The building is designed as a reinforced steel structure with a minimum of static elements. The flexibility of the basic structures provides a lot of possibilities for modifications and the office wing has been furnished with lightweight walls in the interior and concrete lamella with glass windows on the façades. Plus, the open design of the centre leaves plenty of room for future expansions within the complex. 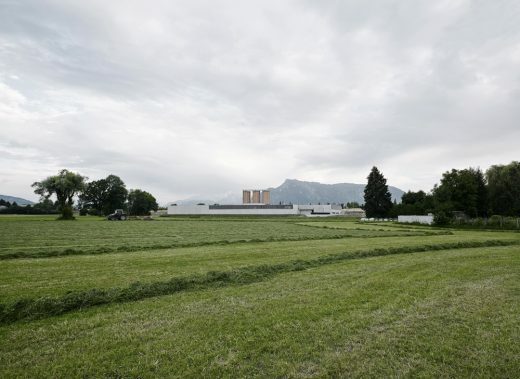 The noise barriers running along the southern and western boundaries of the site to the A1 Motorway and the Freilassing Dual Carriageway have been formally integrated into the overall design of the centre.